It was named the St. Linus Fiesta because of the strong Hispanic culture in the Parish at the time. The First Fiesta was November 16, 1962. Clem Linnebur is probably the longest working member of the committee. It takes a committee of about 25 volunteers from St. Linus parish about 12 months’ worth of planning to make the Fiesta a success. The event is the largest fundraiser for the Parish. The money generated through the Fiesta helps to pay for needed improvements, repairs, and various projects around the parish during the year. The raffle is the biggest and most important fund raising aspect of the Fiesta. When the raffle does well, fiesta does well. If you would like to pick up additional raffle tickets, please stop by the parish office. Last year’s winners were Patricia Lantin and Mark Mallari. This year, eight of our teens, five girls and three boys, have volunteered to run for King and Queen. To vote for the candidate of your choice, simply find the names of the candidates on the back of your tickets and check the boy or girl that you favor. The two winners will be the boy and the girl who sell/have the most tickets turned in with his/her name. Our candidates’ bios will be in the bulletin so you can know a little about each. They are: Girls: Stephanie Berberabe, Annalisa Garcia, Nyomi Ledesma, Dannica Mallari, and Valerie Zavala Boys: Kyle Perera, Chris Perez, and Ramon Perez. Celebrating Family Fun for Over 50 Years!! From the authentic food to family favorite games and live entertainment, St. Linus is the place to be! 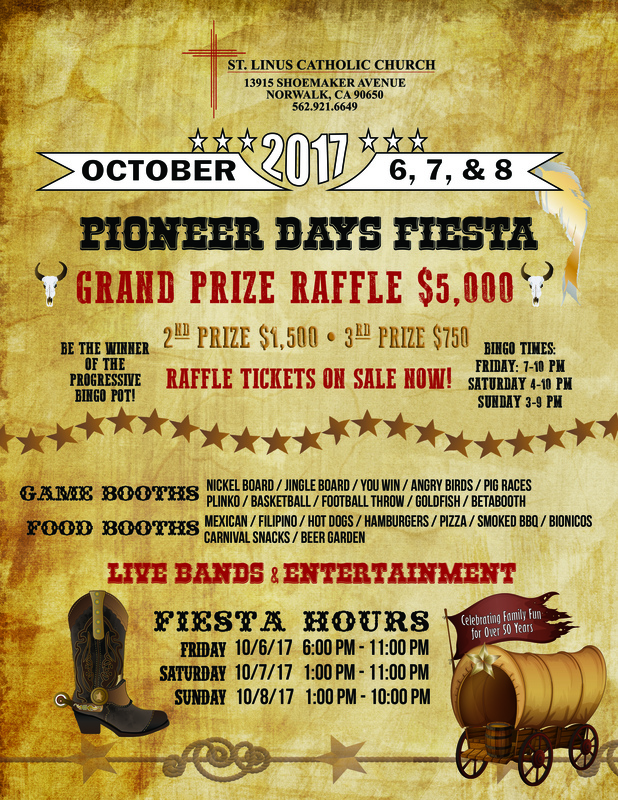 Round up your family and friends and join us for our annual fiesta. The time spent with friends at St. Linus is always rewarding and enjoyable. We hope to see you here! Please visit this page often to see Fiesta 2017 updates! Thank you to all who supported our annual Fiesta. You made our parish Fiesta a huge success! SAVE THE DATE: October 5, 2018.